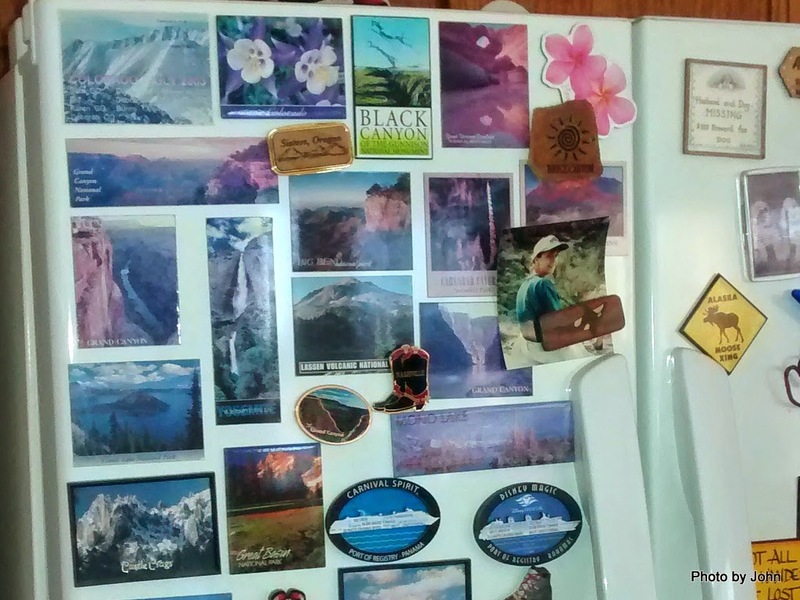 The refrigerator at home is communications central, covered with magnets collected during our travels as well as pictures of family and friends. A surface for magnets is one of the few things missing from the Scamp. I'd toyed with adding sheet metal to the refrigerator door, but liked the poster treatment better. 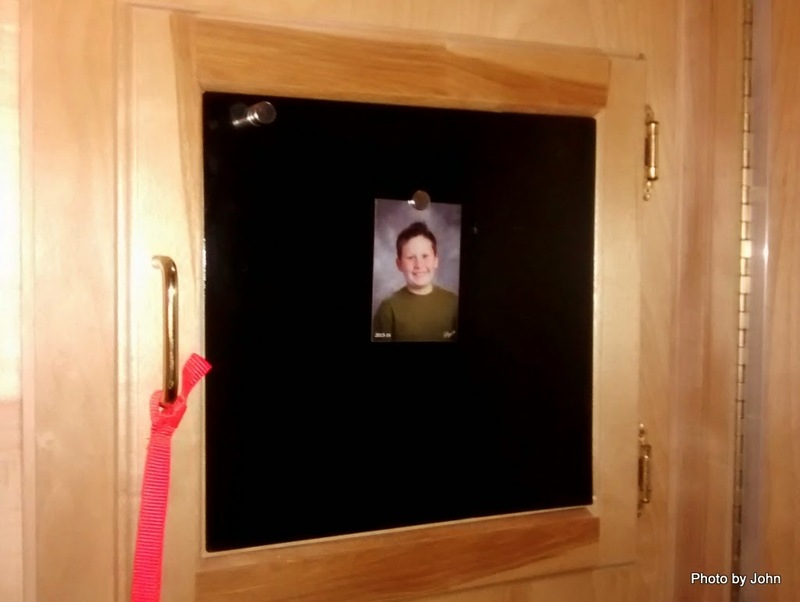 We decided that the door above the closet was the candidate for this simple mod. It's near eye level, and visible as you enter the trailer. I picked up a piece of 24 gauge sheet metal to use. 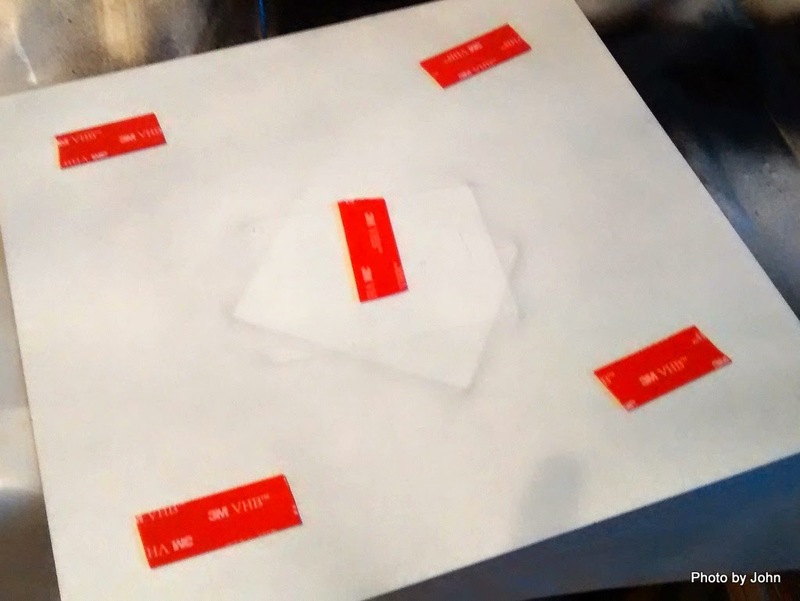 Cutting it was more of a challenge. I have access to a shear, but only for cutting aluminum. I could have cut it with hand shears, but didn't want the wavy edge that would result. I could have found a sheet metal shop, but... I ended up cutting it with an abrasive disc in the Skilsaw. Very easy! 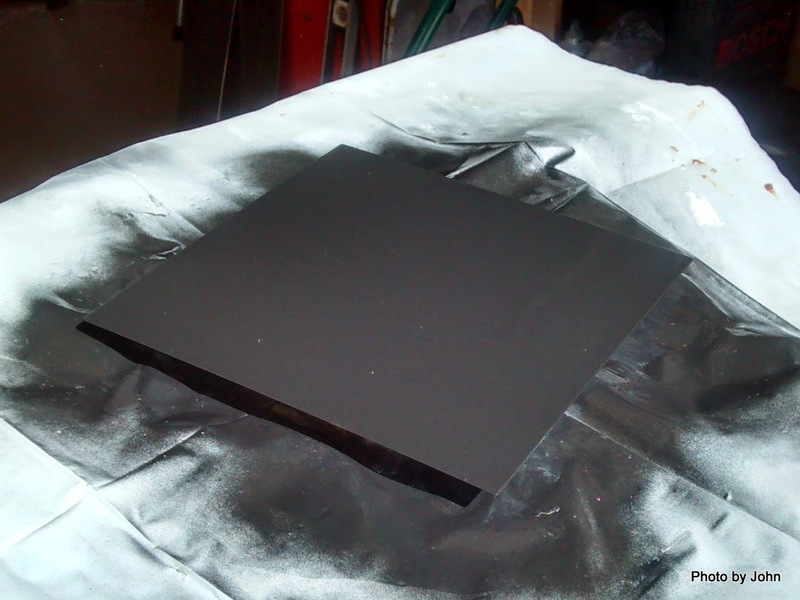 After filing the edges, I painted both faces with Rustoleum primer, and then sprayed the finished face with gloss black. 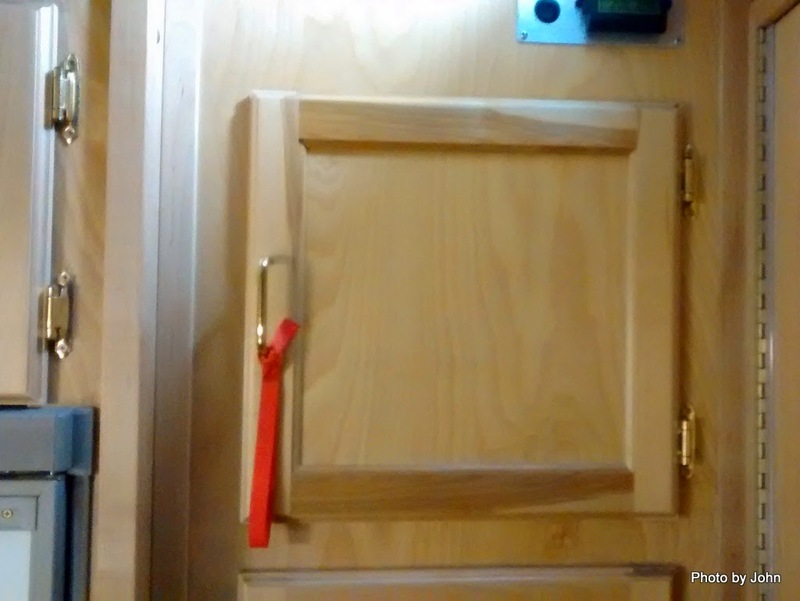 and then it was stuck to the panel portion of the door. I have a short stack of rare earth magnets left over from a boat project that will work for hanging up photos or notes until we can collect a few more decorative magnets. Now if you want to ride along, just send us a photo and you, too, can be stuck up! I'd returned earlier than I wanted from the Arizona Strip trip because I'd been invited to a clandestine early Thanksgiving celebration. I asked what I could bring and without question they wanted some of my roasted veggies. Of course, I didn't think about pictures until they were on the coals. and were boning them out when we got there. It was nice to see many friends, and to see that with no support, the rank and file were doing everything they could to maintain the culture. Lots of food, lots of great conversation, and lots of plates with decreasing contents. I'm really thankful that the culture of caring continues. Congratulations to all the folks that made this happen. While I was at Lees Ferry a couple weeks ago, I started to notice some of the government vehicles parked around the boat launch area. 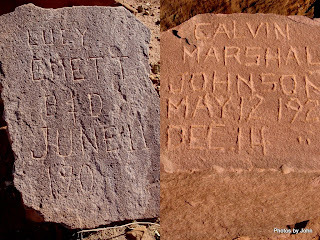 None are marked as to which agency operated them so they could logically be National Park Service, Bureau of Reclamation, U.S. Geological Survey, or possibly others. The first one that caught my eye was this Suburban, about 20 years old but appears to be in good condition, complete with aluminum wheels. Of course, it was parked for several days in an spot that was supposed to be used for daytime parking. I guess I was a bit surprised to see that agencies were holding onto their vehicles this long. The next one raised lots of questions. It was parked in the long term lot where the others should have been parked, so I assumed the driver was somewhere on the river. I would like to think that with the amount of taxes we pay that keeping 40 year old Suburbans in the fleet would be unnecessary. I also thought that someone may have taken tree hugging a bit too far. Turns out that some agencies apparently can afford new vehicles. And yes, it was towing a boat trailer so they were likely on the river in some sort of official or enforcement role, but come on, can't we find something midway between 40 year old Suburbans and brand new F450 Powerstroke trucks with aluminum wheels all around? Is this really necessary? And of course they were parked for days within 20' of a sign that says "No Overnight Parking." Apparently there was a more conservative option. They didn't even order the aluminum wheels but did get the diesel engine. This one is two or three years old, and also towing a boat trailer. It looks like someone has started tree hugging training early, but hopefully they'll keep it in the fleet for awhile. I think the only thing I learned from this was that if you have government plates you can park where ever you want. Government Wash on Lake Mead reminded me of a miniature version of Quartzsite, without the town. Lots of gravel, open views, and folks parked where they find a level spot. I stopped by for a couple days on my way home from the Arizona Strip trip and easily found a spot that didn't require me to unhitch to get level. The next morning I caught this shot as the sun started to rise. There was one recognizable camp. The folks from Aluminarium had their Campendium flag flying. They'd scored a really neat hilltop spot with good views and room for several friends, one of whom was nicely positioned to provide a wind break for the serious winds that came up over night. I counted 27 different RVs scattered around the area. (That's me on the far left.) Not at all crowded but not a solitary experience either. There is no fee for camping, but would be a fee for the National Recreation Area if the entrance you come through is staffed and you don't have some form of National Lands pass. There are a few more spots like this, with fewer people, scattered around Lake Mead and Lake Mohave. November 13, 2014 - I took Squeak on a walk today to see the famous Emerald Pools. The trail to the lower pool is nicely paved, at least from the Emerald Pools parking lot. Once again, we were out ahead of almost everyone. From some of the pictures I’ve seen, the waterfalls and pools must be spectacular during the spring runoff. The fall color does add a special effect! The views of the big red walls, even on an overcast day, were pretty spectacular. I loved this view from the middle pool out across the Zion Canyon. The Zion Lodge is down there in the trees. If my recollector is working right, I think this is the fourth time I’ve visited Zion. But it’s the first time that it hasn’t been the middle of the summer. This place needs LOTS more time, and right now the weather is perfect! Too bad there are other commitments. November 12, 2014 - With all the teasers about hiking the Narrows, I just HAD to do it. The shuttles aren’t running during the week this month, but since all of the Zion Canyon parking lots are full by 10 a.m. or shortly thereafter, I headed out with the intent to start my hike about 8 a.m., ahead of the crowds. Lots of deer and a few nice turkeys to be seen. Pictures were a challenge with the low light of early morning and my tired and limited Olympus (still waiting to get the Fujifilm X-S1 back.) That didn’t stop me for taking lots of pictures – I’ll just not bore you with most. Just turning the corner after leaving the end of the paved River Walk, I could see this was going to be a fun and worthwhile hike. And for the most part, my relatively early departure got me the solitude I was hoping. The pictures actually got better on my way back with more light in the canyon, but more people as well. Unfortunately, I used up most of the camera battery going upstream and didn’t take near as many coming downstream. I continued past Orderville Canyon, curious about what was around each corner. Looking at detailed maps later, I apparently stopped just short of where the canyon from Potato Hollow Spring intersects the Virgin River. Going upstream I saw very few people. I had one barefoot person with shoes in his hand past me going up but I then passed him both directions as he stood at the same spot in the middle of the river taking pictures for over an hour. I also passed a group of three photographers near the mouth of Orderville Canyon. I saw lots of people headed upstream as I headed down (perhaps approaching 50 but I lost count) including a young couple from Nebraska celebrating their honeymoon. I took their picture for them, but never took one with my camera. All told, a phenomenal day! About 7.5 miles total which will totally shock some of my friends, but it was delightfully cool and there was a river involved – perfect hiking situation! Squeak and I swung by the boat launch about 7:30 a.m. to see how far the water comes up the boat ramp as we were leaving Lees Ferry. Still less than 1/3 of the pre-dam flows during some of the summer floods. I understand why they limit it to 32,000 cfs. Much higher would cause problems with some of the current infrastructure. The post in the center of the picture is on the cable stretching across the beach that rafts tie off to when they’re rigging. I stopped at the Dominguez & Escalante Expedition historic marker, in part because I haven’t stopped there before. They wandered through this part of the country 240 years ago! My target for the day was Zion National Park but there are significant grades between here and there. I didn’t stop at Jacob’s Lake – the bakery with the famous cookies was open but the BLM campground was closed for the season. Usually, we’d hang a left there and head for the north rim, but today my target was Zion National Park. A stop for a few groceries and then McDonald’s free wifi to upload the past three blog posts and then it was on to Zion. East of the tunnel there were all sorts of NPS rangers and SAR crew rigging up. Maybe it was practice, but I’m betting someone had a bad day. Speaking of tunnel, there is a $15 surcharge for vehicles over 7’10” wide (including mirrors) or over 11’4” high because they will require 1 lane traffic control through the tunnel. Sure is nice to be towing a Scamp! The red rock and the changing leaves in the fall made for a nice contrast. As a desert dweller, we miss out on much of the falls colors. I was able to get a spot in the Watchman campground for three nights without reservations. Sounds like they may be full for the weekend. I was surprised to get a spot in a National Park that had electrical service. $10 for seniors – not bad! And just around the loop from me are two bloggers that have been posting eye candy about the Moab area. Lynne and Suzanne’s posts about all the hiking they’re doing in Zion should start showing up one of these days. Meanwhile, Mark and Gayle’s posts about their visit to Zion are part of what attracted me here. BTW, Watchman is on recreation.gov and it sounds like reservations are essential for smart people. South Campground was first come - first served, but I didn't think it was as nice. This was posted thanks to the free wifi at McDonalds in St. George, Utah. as well as a very nice dugout that appears to have been reconstructed recently. The large house was built in 1935 when the area was known as the Weaver Ranch. No ranch would be complete without a collection of rust. Just west of the buildings and the rust, was a fenced cemetery. 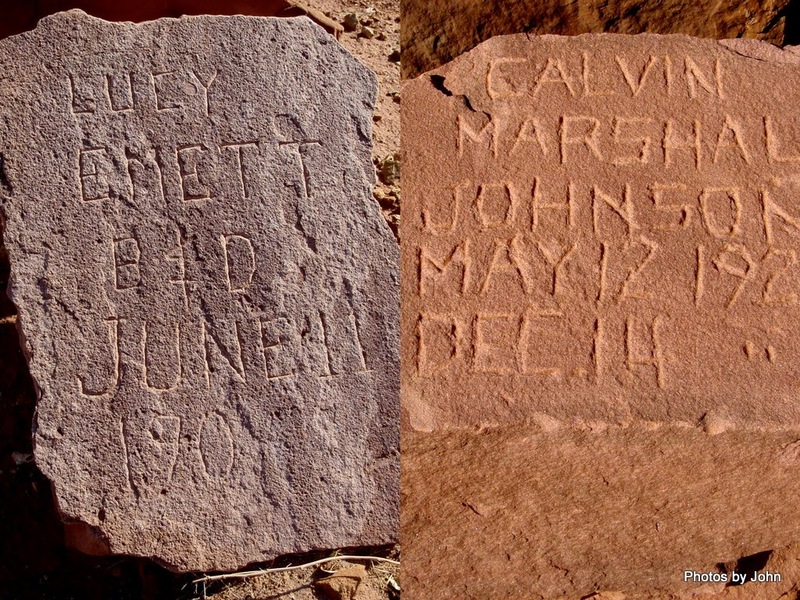 These hand-carved headstones tell a part of the story: Lucy Emett, born & died, June 11, 190? and Calvin Marshall Johnson, born May 12, 1928, died December 14 the same year. But the most poignant of all was this stone added later to supplement the four crude sandstone markers behind it – one family, four children, all who died within 45 days of one another in 1891. No wonder they called it Lonely Dell. The trail continues for 45 miles beyond Lonely Dell through the Paria Canyon. It’s not a place to be in the summer heat or when there are storms brewing, but it was nice to see some water still flowing in the river from recent storms. There are some minor remains of cattle operations, and since the portion up river from Lonely Dell is BLM (permit required for hiking), it’s likely that there are still cattle in the area. The ground, even 10 feet above the current river level makes it clear that water is key to life in the Paria. "Lee's Ferry: From Mormon Crossing to National Park."